BLUE RIDGE, Ga. – Students at Marjory Stoneman Douglas High School in Parkland, Florida, returned to class today, Feb. 28, just two short weeks after one of America’s deadliest mass shootings in modern history took place in their halls. In the wake of this tragedy, which claimed 17 lives, discussion have opened up about school safety and what can be done to prevent situations like this from occurring in the future. 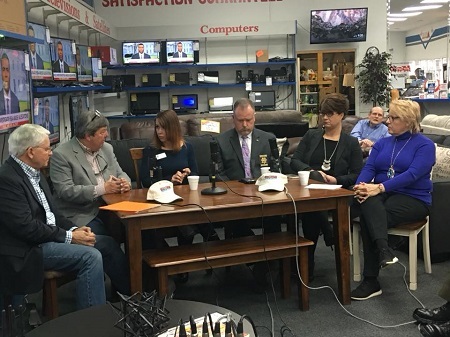 Brian K. Pritchard (BKP), chief executive officer of FetchYourNews and host of Good Morning From The Office morning show, invited local officials from Gilmer and Fannin counties to address the safety of our local school systems. County officials from both Fannin and Gilmer counties met to discuss the safety of our schools. In opening the discussion, BKP directly asked both Gilmer and Fannin County School superintendents how safe do they feel the schools in our area are. “What I feel has come out of Parkland (shooting) is a breakdown in the system,” BKP pointed out to the guest panel and questioned how officials have addressed any recent incidents. 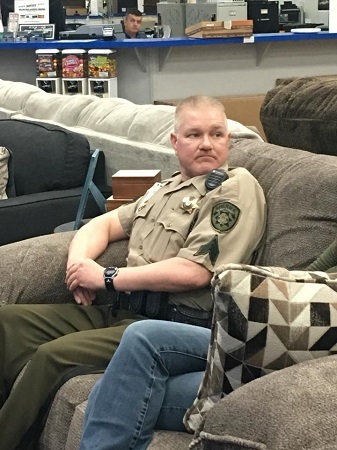 Gilmer County Sheriff Stacy Nicholson replied that his department has had to respond to incidents almost daily for the past two weeks, but clarified that most complaints are not serious. “The problem is law enforcement can no longer say that’s not serious. We have to take it serious,” Nicholson explained. Many counties in Georgia do not have school resource officers (SRO) assigned to every school in their district. Fortunately, for both Fannin and Gilmer, this is not the case. All schools within each system has its own SRO, and all panel members feel that this is a major element in keeping our schools safe. Gilmer County SRO Sgt. Greg Dodson discussed SRO training and duties. “Are all the SRO officers armed this morning?” BKP directly asked the panel. Both Nicholson and Fannin County Sheriff Dane Kirby replied that all officers on all campuses were armed. “If you see someone at the schools that you don’t recognize, make sure they have a visitor pass, that they’ve gone through the office properly,” Dodson added. Other duties include checking parking lots, bathrooms, hallways, and interacting and developing relationships with the students. In Gilmer County, to become an SRO, a deputy must submit a formal letter requesting that position. A panel of the officer’s peers then formally recommends who they feel should be placed in that position. Sheriff Nicholson makes a final decision based on the panel’s recommendations. 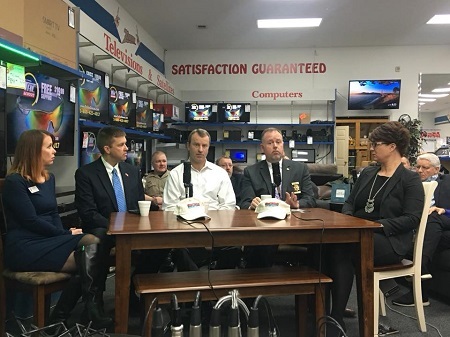 “From the very get go, it has to be what that person really wants to do,” Kirby said, explaining that the SROs in place are not only trained but also have a passion for that particular field. Training for an SRO goes beyond that of a police academy. This training includes a School Resource Officer course, Crisis Intervention Training, Gun Safety, and in-service training such as active shooter scenarios. Appalachian Judicial Circuit District Attorney B. Alison Sosebee was present to discuss the legal aspects of threats against a school and what her department does in collaboration with law enforcement to combat any potential crimes. “I just need one referral to start. I need one concerned student. I need one diligent parent. That’s what allows us to be able to initiate the investigation and to assess what we need to do next,” Sosebee described of the process of how her department can become involved. 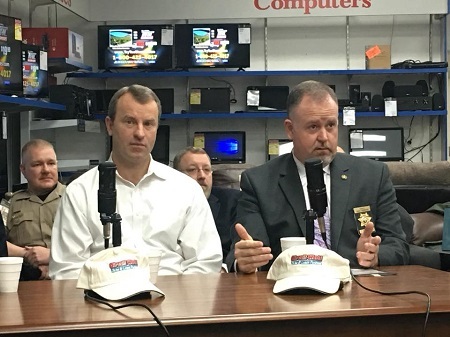 Fannin County Sheriff Dane Kirby and Gilmer County Sheriff Stacy Nicholson address law enforcement’s role in providing safety for our schools. Sosebee said we are fortunate to live in a smaller community where residents feel comfortable speaking up when there is an incident that makes them feel uncomfortable. “No matter how good you are technologically, there is no substitution for a good tip,” Fannin County School Superintendent Dr. Michael Gwatney expressed in similar views. Both Fannin and Gilmer County school systems continue to take steps to improve safety measures in their schools. Gwatney is looking into extra safety measures using technology. This would include a large network of monitoring devices. Wilkes is working to renovate Gilmer High School. She would like to implement scan cards for access to doors and is working to restructure the building to create a single point of entry through the front office. Texas has legislation, School Marshal, to allow teachers to carry weapons on campus, and Florida recently passed similar legislation. Currently in Georgia, there is no statewide legislation on the issue, but rather Georgia allows local school districts to create their own policies regarding this matter. Gilmer County has looked at sample legislation from other counties in the past, but never voted to enact a policy. Wilkes said that she would favor a policy that would require the individual to qualify with a firearm and that would obligate the individual to attend an annual firearm training course. Wilkes also would like there to be anonymity in which teachers are armed within the school. “It would have to be very regulated. It takes the right person, like it takes the right SRO,” Wilkes shared of her stance. The panel also expressed frustrations on a system that sometimes works against them in their efforts to keep our children safe. BKP’s All Star Panel questions officials on a number of issues that the school systems face in regard to safety. Just like law enforcement, the school systems feel that there is legislation and policy in place that ties their hands when they witness “red flags”. BKP pointed out the Americans with Disabilities Act (ADA), which has grown since it was first enacted and states that schools being a government agency must accommodate individuals with diagnosed disabilities. In such cases, if a student makes a threat or acts in a way that requires disciplinary action, the school must first have a Manifestation Hearing. In a Manifestation Hearing, a panel is made up of a licensed school psychologist, the student’s special education case manager, a teacher that works directly with the student, an administrator, and the parents or guardians of the child. The panel determines if the threat or infraction is directly related to the student’s disability. If it is deemed that it is in relation to the disability, then disciplinary action cannot be taken. If it is deemed that the issue is not related to the child’s disability, then a tribunal is formed to determine what disciplinary actions should be taken. The panel agreed that collaboration between departments along with a proactive stance on safety is the best route to take when it comes to the welfare of our counties’ children but felt that changes could be made in legislation that would make providing our schools with this security a much more efficient process. You can watch BKP’s Good Morning From The Office #AnythingGoes School Safety Special in the video below.